Thank you for visiting our web site in reference to your wedding reception or banquet, on our site you will find plenty of pictures and web pages that are precise and to the point, giving you the information you need in a quick and timely manner. 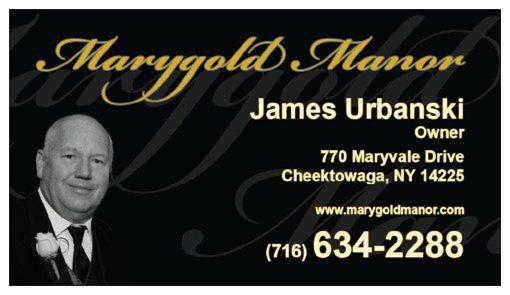 Marygold Manor is and has been a family owned and operated banquet facility since we opened our doors in the summer of '69, located just outside the City of Buffalo in New York, run more like your favorite neighborhood restaurant than like a large impersonal corporate banquet hall or hotel. My wife, my kids and I are always thinking of ways to improve our facility, in fact in the past few years we have added a new banquet room, outside ceremony site, French patio doors off the back of our Reflections room leading to a new outdoor patio, we are currently building a new banquet room, we are calling it The Kensington Room with an industrial look for todays brides and grooms. Not only have we withstood the test of time, we have changed and adapted with it, meeting the needs of a modern bride. 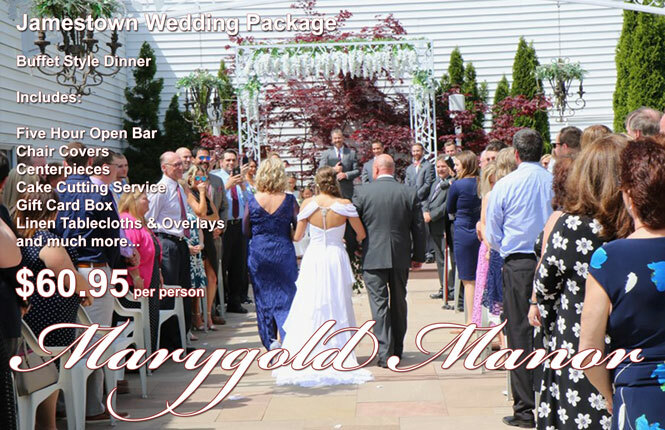 Marygold Manor specializes in wedding receptions with wedding ceremonies and custom designed menus. All of our dinners start with fresh Costanzo's rolls & butter, a chef salad with our very own house dressing. You may select from a Family Style or Buffet Style dinner, which contain two or more hot meat entrées. If you prefer a Sit-down Plate Style dinner with one entrée or if you wish, up to three entrées may be served. All dinners include your choice of mashed or baked potato, a fresh Californian mixed vegetable and two additional hot side dishes. We also provide at no extra charge fresh brewed coffee, decaffeinated coffee and hot tea. You may choose from either a Sit-down Dinner with a single entrée or a Buffet Dinner with two entrées starting at $35.95 per person, Family Style Dinner also including two entrees is available for an additional charge of $4 per person. You may also select from our Williamsburg Wedding Package, or our NEW Ultimate Wedding Package. For an additional charge of $12 per person your banquet may include a four-hour open bar, which contains a wide selection of liquors such as vodka, gin, scotch, whiskey, rum, bourbon, and peach schnapps. Cocktails such as whiskey sours, manhattans and martinis, bloody marys along with Labatt Blue beer, Chablis, Rosé & Burgundy wines. You may request an additional hour of open bar at a cost of $4 per person. We at Marygold Manor know that once you have your wedding or banquet with us, that you will continue to call upon us for future events. We are in the business of building long lasting friendships that span not only years but decades; Bridal Showers, Baby Showers, Baptisms & Christenings, Communions, Sweet 16 Parties, Birthday Parties, Graduations, then 25th & 50th Wedding Anniversaries we do it all. So think of us as your celebration destination for events of all shapes and sizes. As mentioned Marygold Manor specializes in personalizing the arrangements for each reception. This personal technique starts with your first visit and continues throughout the day of your banquet, to make absolutely positive that your wedding reception or banquet is perfect in every way possible. Please call or email us anytime to setup a tour of our wedding and banquet venue. Copyright 1999-2018 MARYGOLD MANOR, Inc. All rights reserved.